Lodi Apple This tree is ‘Mountain Grown’ at Alpha Nursery and is an ‘Idaho Preferred’ Plant. 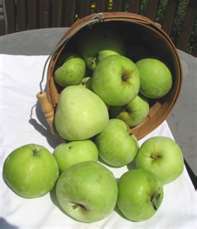 Lodi Apple matures to an overall greenish yellow color. The fruit is crisp and juicy with a yellow white flesh. It is sweet, with a tart flavor. Lodi Apple likes to be planted in full sun. Lodi ripens early and does not store well. . It produces apples in August. Somewhat self fruiting but greatly benefits (more fruit) when cross pollinated with Honeycrisp, Gala or Liberty. Fruit trees attract wildlife, birds, and bees. They are good for fresh eating, making jams, jellies, sauces, and pies. Lodi Apple can also be planted in a cottage garden.